Home>Anxiety >Are We Carrying More Than Our Load? Hmmm what an interesting thought! 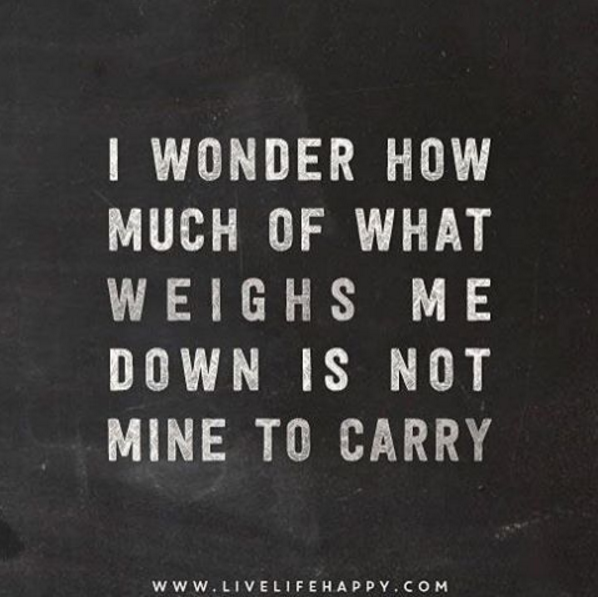 How much of what weighs us down is not even ours to begin with? How much of the things we worry about, stress over, or feel sad about are other peoples’ wounds that we feel responsible for? As a therapist, I have a big caretaker part and while it serves me well in my professional career, one of the biggest lessons I’ve had to learn in my personal life is to separate my stuff from that of those I love. You see, it’s so easy to “just take it on” but often we have to stop and ask ourselves- is this my injury or am I taking it on unnecessarily to protect someone I love? And is that fair to us or them for that matter? In addition to paying attention to your own caretaker, I encourage you to think about how much of what weighs you down today is your beliefs and how much was taught to you by someone else- a parent, friend, coach, mentor, etc.? For example, if you had a parent who strongly emphasized financial security as the key to success growing up, you may feel pressure to achieve through your career. But how do YOU define success today? And how much of the other person’s belief, do you actually agree with? I know it’s weird to tease apart your belief system like this, but it can help you to separate what burdens you may be carrying that are not your war to fight. So try to look at it with a new lens and see if you can figure out what you believe separate from what you’ve been told. It’s amazing to see the difference!